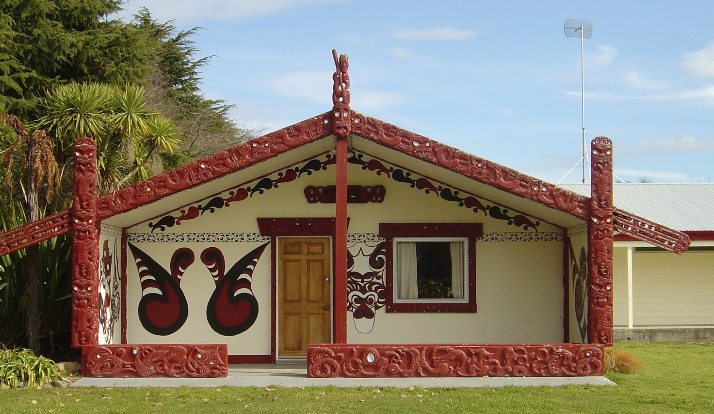 The Marae is a special place for Māori. It is a spiritual place where the dead are mourned, guests are housed and feasts are held. It is where Māori can learn and celebrate the richness of their reo Māori and tikanga. The Tekoteko represents the ancestor Tia which is also the name of the Wharenui. Tia was one of the chiefs that came to Aotearoa on the Te Arawa waka (canoe). At the time when Ngātoroirangi left Maketū, Tia, travelled up the Kaituna River to Rotorua. At a place further on, he unintentionally touched the dead body of an important chief. This was a forbidden act, and he needed a priest to cleanse him. This ceremony became known as Te Horohoroinga-nui-a-Tia (the great cleansing of Tia), and gave rise to the name of the area – Horohoro. From there, Tia continued west until he came to the Waikato River. He noted the murkiness of the water and reasoned that someone was ahead of him. This place was named Ātiamuri (Tia who follows behind). Determined to meet those responsible for the muddy water, Tia hurried after them. At a place near Wairākei, he came to some river rapids whose tiered form fascinated him. Today they are called Aratiatia (the stairway of Tia). Journeying on to present-day Lake Taupō, he was disappointed to find a large tribe, Ngāti Hotu, already living there. Tia continued around the eastern shores of the lake to Hamaria, where he noticed that the peculiar colouring and appearance of the cliff face resembled the rain cloak he was wearing. In response to this phenomenon, he named the cliffs Taupō-nui-a-Tia (the great cloak of Tia). This name was later given to the lake by the occupying tribes that followed. The Amo on your right hand side (as observer, looking on) represents Tauhara ‘The Protector’. The Amo on the left hand side (as observer) represents Tongariro ‘The Striking One’. The wharekai is named for Tia’s mother ‘Karikaroa’. All carved figures outside and inside the wharenui have some intimate association with the local tribe, Ngāti Tuwharetoa, and all other tribes of Aotearoa. The conceptions of ancestor respect and allegiance, man’s struggle to choose between good and evil, love of children, pride, suffering and defiance are conveyed in the carvings and are there to be read by the initiated. (An ancient karakia offered by Ngatoroirangi, the high priest of the Te Arawa canoe and great descendant of the Ngati Tuwharetoa tribes upon his arrival to Te Awa o te Atua (Matata) and Tauhara, Taupo). The region known as the central plateau presents the viewer with an interesting combination of mountainous, alpine, tussock lands blended amongst native beech forests, lakes, rivers and farmlands. Tokoroa to the north is referred to by many as the home of the Kinleith Mill and the western gate to the Kaingaroa forest. Taupo is of course New Zealands’ action capital and home of the largest lake in Aotearoa. Further to the south is Turangi, sometimes referred to as “the trout fishing capitals of the world”. The Army training group is based at Waiouru and nestled into the southern farming hills is the small town of Taihape. On our north western boundary are the towns of Taumarunui and Te Kuiti, home to the King Country region. The region is garnished by the magnificent central plateau mountains, most of which are either active or dormant volcanoes who stand as guardians of our district. Among these great mountains are Tongariro, Ruapehu, Ngauruhoe, Tauhara, Pihanga, Tihia, Kakaramea, Hipaua and Pukeonake just to name a few. Lakes Taupo, Rotoaira and Otamangakau add to the scenery as does the mighty Waikato, Waitahanui, Tongariro, Waipakihi, Whanganui, Kurutau and Waihaha rivers. On the Western shores of Lake Taupo stands the ancient Pureora forest and to the north east of Taupo, the Kaingaroa, Waimihia and Urewera ranges. As is well known to most travellers, this region rich in beauty and is subject to many moods and weather changes. The immediate vicinity of Taupo is home to the Ngati Tuwharetoa tribe, whose boundaries stretch from Te Awa o te Atua (Matata) on the Bay of Plenty coast to Taihape in the south. On the northern boundary sits the Te Arawa confederation of tribes based around Rotorua/Rotoiti. To the north and eastern boundaries lie Ngati Tahu (Reporoa), Ngati Manawa at Murupara, Tuhoe in the Urewera ranges and Ngati Kahungunu of Hawkes Bay on the eastern side of the Kaimanawa and Kaweka ranges. Taihape also forms part of the Rangitikei basin and is also home to the Ngati Tama-Whiti tribe; close relations of Ngati Tuwharetoa of the Taupo region. The Taumarunui region to the south-west of lake Taupo also holds close ties to Taupo being a mix of Ngati Tuwharetoa and Ngati Maniapoto of Tainui. Finally, to the immediate north west of Taupo towards Tokoroa is Ngati Raukawa; another tribe closely related to Ngati Tuwharetoa. It is appropriate at this juncture, to point out that the region of Kawerau was and still is an important and strategic place for Ngati Tuwharetoa. This is where the ancestor Tuwharetoa-i-te-Aopouri (aka: Tuwharetoa) lived and remains to this day an important area in terms of the history and geography of the Ngati Tuwharetoa tribe. In local legend, the mountain Putauaki (aka. Edgecumbe) once resided amongst the great central North Island Mountains. Likewise Mount Taranaki on the west coast near New Plymouth. Ngati Tuwharetoa’s claim to the central North Island region comes from the great ancestor and navigator of the Te Arawa canoe, Ngatoroirangi (heavens runner). He wa sa “tohunga kokorangi (navigator and seer). It was this ancestor who after guiding Te Arawa to Aotearoa/ New Zealand, made his way from Te Awa o te Atua (Matata) on the Bay of Plenty cost via Tarawera to Mount Tauhara in Taupo. He saw the great peaks of Tongariro, Ruapehu and Ngauruhoe to the south and desiring to ascend these great mountains, made his way there, crossing the Rangipo desert along the way. As the great tohunga ascended the mountain, he became caught in a great blizzard and called to his sisters in Hawaiki to send him fire so that he may survive the storm. “E Kuiwai, E Haungaroa e… Ka riro au i te tonga. Tukuna mai te ahi!” (Kuiwai, Haungaroa, I am being seized by a great storm, send me fire so that I may survive!). His sisters heard his call for help and despatched fire through two mighty tipua (deities) known as Te Pupu and Te Hoata. These deity travelled through subterranean tunnels, surfacing on occasions where they would expel huge amounts of pumice and hot ash as they travelled. Among these places were Whakaari (White Island), Tohora (Whale Island), Rotoehu, Rotoiti, Tarawera, Orakei-Korako, Wairakei, Tokaanu and Tongariro. All of these places are well known for their geothermal/volcanic activity. By the time heat had arrived to Ngatoro, there were only a few embers left, which he named Ketetahi (one basket). Furious at this, the tohunga stamped his foot into the ground opening up a crater and threw the embers into it. The crater exploded into life, which he named Ruapehu. He then took his staff, rammed it into the ground and shook it violently (Ngauruhoe). Again, he threw embers into the opening and the mountain burst into life, thus becoming the great mountains of fire as associated with Ngatoroirangi and his descendants the Ngati Tuwharetoa people. See the dawn glowing over the land, striking upon the peak of Tauhara! Tauhara is one of a number of mountains who long ago, lived together on the central plains of the North Island. They were considered more than just mountains; they were warriors, ancestors and more than this, volcanoes. There was old Ruapehu the giant, Tauhara the quiet one, Putauaki the watcher, the fiery Taranaki and of course mighty Tongariro. They lived happily together and guarded their territory with awesome power. There was one other mountain; a female. Her name was Pihanga and before long, her beauty had captured the attention and desires of the warriors. During this time, they all lived together as a family, guarding their respective domains. Because of their desires for Pihanga, that was about to change. It wasn’t long before their desires were overtaken by jealousy and contempt for each other and soon they would turn their attention and destructive power towards each other. Tongariro stood demanding the others attention “We all know that each and every one of us is in love with Pihanga, but there can only be one and that is how it must be”. “Taranaki shall claim her” said the fiery one, “No” called Tauhara, she loves me, I am the one! ‘No way’ called Putauaki, “I am the one” They argued and argued until once again Tongariro spoke. “It is clear that we will continue to disagree. I will not share her with any of you, therefore I propose that we fight for her hand”. This they agreed to and before long the skies were filled with black smoke, steam and ash. Earth shaking, fire and brimstone; the war had begun. For what seemed and eternity, the great mountains battled to gain the ascendancy. Massive boulders were hurled at each other and great plumes of ash and mud stained the sky. Thrust and parry; each warrior attempting to smash the other. Eventually it came down to two; mighty Tongariro and fiery Taranaki. The rest were left to watch as the last chapter of the almighty struggle unfolded. Tongariro breathed deeply and with an almighty push, hurled a barrage of house sized boulders at Taranaki, severely wounding him. Taranaki replied with one last barrage of his own, only serving to enrage Tongariro even more. With one last effort, Tongariro breathed in and with an almighty thrust, completely “blew his top” and sent a shower of massive mud, rock and ash onto Taranaki, completely overwhelming him. It was over….Tongariro had won and claimed the beautiful Pihanga. But he wasn’t finished yet. Turning to the others, he said. “We are no longer brethren. This is my domain now. Ruapehu is my old friend and will remain here if he wishes, but the rest of you must leave the district during the night. When the sun rises in the morning wherever you are, you will be fixed to that spot forever. Go, you must leave now!” Ruapehu remained. Taranaki, still harbouring a grudge, steamed off to the west carving out the Whanganui river, finally settling in the district that bares his name. Putauaki headed across to the eastern Bay of Plenty carving out the Rangitaiki river, finally settling near the town of Kawerau. Tauhara on the other hand lumbered his way around the great lake (Taupo) occasionally stopping to glance back at Pihanga. By the time the sun has risen, he had only made it to Taupo where he stands today, guarding the northern Taupo region and still staring across at his beloved Pihanga. Nowadays, Tongariro is acknowledged as the great ancestral mountain of the Ngati Tuwharetoa tribe and represents their “ahi kaa” or fires of occupation. “Ko Tongaririo te maunga, ko Ngati Tuwharetoa te iwi” meaning Tongariro is the mountain and Ngati Tuwharetoa are the people. Tauhara on the other hand has become acknowledged as the mountain of the Hikuwai (Northern Lake Taupo region) and is acknowledged in his own right as a warrior and ancestor. His association with Pihanga continues in speeches on the marae and is a relationship which generates contest and rivalry to this day. (Tauhara is the mountain, Taupo is the lake and Ngati Tuwharetoa at Taupo are the people). An integral and important aspect of the Maori culture is the belief and connection to the supernatural. That is, the relation through stories and experiences of beings or incidents that have occurred over time and are attributed to the “paranormal” or “supernatural”. This is quite normal within te ao Maori or the “Maori world” because the two are inextricably linked. Taniwha have always conjured up the most voracious stories, riddled with monsters and horrific events that are difficult to understand, but certainly generate much interest and debate. It is unlikely that you will find a person who has seen one, however there is a huge reference to this creature, which generates considerable interest. Lake Taupo has one of the lands most famous taniwha; Horomatangi. It is said that he was put there by the ancestor Ngatoroirangi to protect the lake. There are other lesser known taniwha such as Kaiuru, Owheao and Matawhero; these taniwha also placed to protect or guard specific places (normally rivers) and people. Have you heard of Te Ririo? Te Ririo; the one who never stops, always on the “hoof” and gone as quickly as seen.